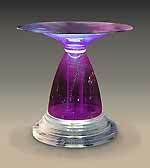 this stunning Dining/Entry table is 30" tall, with a 54" round top. 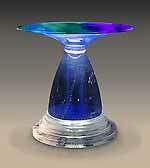 The base is hand blown cobalt blue glass with silver leaf and a crystal overlay. The beveled tabletop is optionally colored using the nearly lost art of Reverse Painting. The anchor is acrylic, with supporting structure and optional interior lighting. Prices vary depending upon size, techniques involved, lighting systems, etc. Production can be completed in 6-8 weeks. Please contact us to discuss available options. 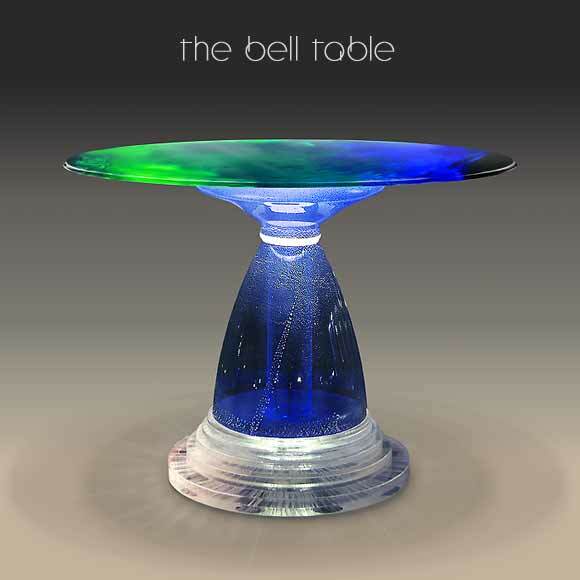 The perfect complement to The Bell Dining/Entry Table. 18" tall, with an 18" round top. Both styles are available in the six colors shown.